The band-aid fix for repairing cracks in concrete is the simple mixing of a polymer-modified cement product in a bucket with water, then wiping the mud over the cracks with a trowel. Doing so is neither a structurally sound solution nor a long-term fix, but it will suffice if the cracks are merely symptoms of the maturation process of concrete — small cracks that occur as concrete dries when the mix is over-hydrated. But, a quick fix is not adequate if the cracks are the product of pressure or torque from an outside agent like a tree root or ground swell. Traditionally, fixing cracks in concrete properly required the removal of the crack all together, a job that entails removing the concrete around the cracks and re-pouring the section. However, in instances where the concrete supports substantial weight or is supported by rebar, removing concrete can weaken the structural integrity of the concrete and lead to further damage. Fortunately, today’s epoxies are so advanced that, once cured, epoxy often has greater tensile strength than concrete. That means taking a chance of affecting the structural integrity of a wall or flat work is minimized to a great extent through the use of industrial epoxy. However, using epoxy — while it can slow or prevent the growth of cracks — does not produce the same cosmetic consistency as removing the cracks completely and beginning anew on a cracked portion of concrete. There are three types of concrete cracks: cracks in concrete without rebar; cracks in concrete with rebar; and cracks in concrete that is structural support. Determining the type of fix a crack requires is a matter of understanding the purpose of the concrete. When concrete is poured for minimal-weight-bearing projects like: patios, sidewalks, and driveways, rebar is not a necessity. Cracked concrete that does not contain reinforcing bar can be fixed by cutting out the damaged section with a concrete saw, breaking up the concrete with a sledge or jackhammer, and refilling the gap with fresh concrete. 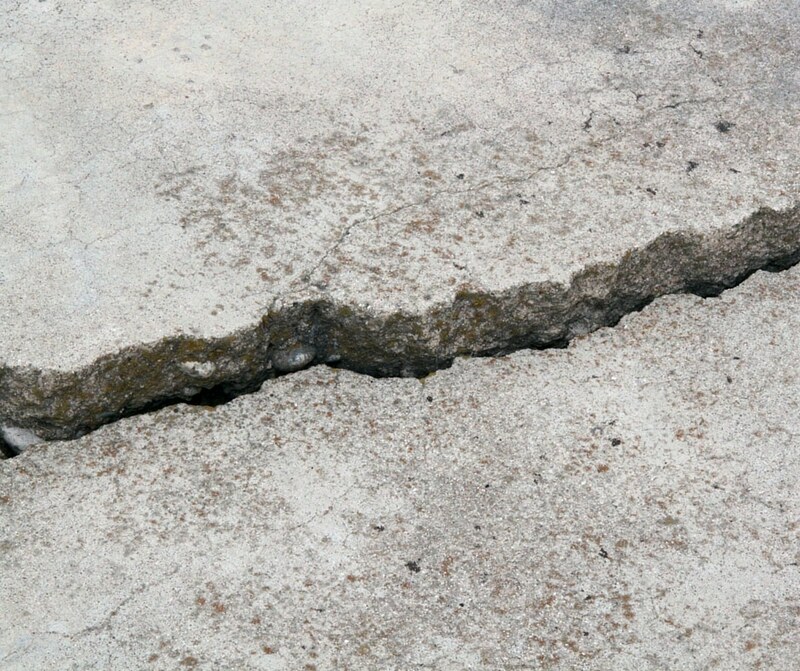 Prior to refilling the section with concrete, it is important to determine what caused the concrete to crack in the first place and take counter-measures to prevent the same damage from occurring in the future. Roots are a common cause of cracks in flat work concrete. By cutting the roots and pouring a substantial amount of rock salt on the ground before re-pouring the section is generally a long-term solution to root problems. Ground swellings is a more difficult problem to fix. The best means of preventing ground swelling is to dig a hole in the ground and fill it with extremely porous material like crushed rock or full the hole with an extremely non-porous material like clay. Filling the hole with concrete footer up to the level of the existing concrete can also prevent the section from re-cracking. The same process can be used to repair the cracks in minimal-weight-bearing with rebar as that without. However, there is an additional step. It is critical to only cut a few inches into the concrete with the concrete saw so as not to cut through the rebar. Using a jack hammer to break the concrete out is not a good idea when rebar is involved or the risk of cracking or breaking the concrete around the cracked section to be removed is increased exponentially. Use a hand sledge and a carpentry hammer to minimize the risk. Again, take measures to prevent the new concrete from cracking as a result of the same issue, then re-pour the section. Repairing the cracks in weight-bearing concrete with rebar is a significantly more difficult task to perform than fixing minimal-weight-bearing cracked concrete. Cutting out sections can both weaken the structural integrity of weight bearing concrete like retaining walls, footers/foundations and columns. The first step to take is to eliminate the catalyst of the cracking. Fixing the cracks in a retaining wall, for example, requires digging out the material behind the wall, putting in a proper drainage system, filling the cracks with industrial epoxy, then refilling the gap between the wall and the material with material that is less prone to swell. Cracks in footers/foundations and block walls can also be repaired using epoxy, but again, it is critical to eliminate the cause of the cracks. A house settling, for example, may require the construction of a boot on the outside of the foundation to prevent any further settling. Cracks in a column are another substantial issue. While there are means of filling in the cracks, preventing further cracking is the largest issue. That may require the addition of more columns to support the weight above. Another option is building a rebar cage outside the column, drilling six-inch holes into the existing concrete, driving rebar into the holes, attaching that rebar to the cage, then forming and pouring more concrete around the column. Fixing cracks in concrete is a job-by-job determination. The questions that require consideration prior to determining what is required is does the concrete bear a substantial load and does it have rebar? If not, the fixes are relatively simple. If you have other unanswered questions, contact our team at BN Products today. We are passionate about helping people find the right tools for them and their projects.